Here I report, discuss, whinge or argue on matters related to high fidelity, home entertainment equipment and the discs and signals that feed them. Since this Blog is hand-coded (I like TextPad), there are no comments facilities. But feel free to email me at scdawson [at] hifi-writer.com. I will try to respond, either personally or by posting here emails I consider of interest. I shall assume that emails sent to me here can be freely posted by me unless you state otherwise. For the past few years I've been writing reviews for Australian HI-FI. Rather than let them merely die, I've started loading up onto this site. Just go here. There are six reviews there now. But I've got another 42 which I shall upload over time, plus I do another review each month. So, to begin, we have Cruel Intentions, Dangerous Liaisons, Halloween, Halloween H2O, The Terminator and Terminator 2: Judgment Day. When I was in my final year of primary school (aged around 11), I applied for a bursary (a kind of small scholarship). A teacher asked me about my reading habits and suggested that, for the purposes of winning the bursary, I was partaking of the wrong end of the library. That library had fiction at one end, non-fiction at the other. I was always at the latter end. Duly directed, I scanned the books at the fiction end. The teacher had wanted me to read the appropriate fiction classics. Instead I looked for interesting novels. The two authors who I first came upon, and whose novels inspired in me a life-long love of reading, were Robert Heinlein and Andre Norton. The former died in 1988. Now Norton has herself just passed away. I failed to win the bursary. But having since read some of those classics, I'm glad I didn't read them at that time. I may have gained the bursary, but may also have failed to learn to love reading. Thank you Andre Norton. The aim of makers of high fidelity audio equipment is -- or at any rate, ought to be -- to produce equipment that does not modify the signal, other than convert it (from a digital to analogue representation, or from electrical to acoustical action) or amplify it. One component of this is having a totally flat frequency response. It may seem odd, then, that much of the technical measuring of audio equipment involves shaping the measured frequency response, using A-weighting. The purpose of this is to provide a signal to noise ratio figure that more closely represents the human experience than a straight unfiltered measurement. The human ear is very much less sensitive to, for example, bass frequencies, than it is to midrange frequencies. Our ears are at their most sensitive around 3,000 to 4,000 hertz. A nasty noise produced by an amplifier in this range of frequencies is very much more intrusive than a deep bass hum. It is hard to find on the Web precisely what action an A-Weighted filter has. Happily, Greg Borrowman, the editor of Australian HI-FI (for which I write), is a true gentleman. Having researched the matter and generated the curves, he has given me permission to provide them to the world via this site. It was apparently used when measuring noise in avionics applications, because it penalised engines with lots of output (noise!) in the speech area. I shall have to set up a download page for this kind of thing. Shall do so in the next few weeks to avoid people having to search the Blog archives. UPDATE (Tuesday, 22 February 2005, 9:22 am): Greg also forwarded the underlying data for these curves in text files. The data is the decibel offsets from a flat response at one third octave intervals from 10 to 40,000 hertz. I've taken the liberty of stuffing them into an Excel spreadsheet and graphing them, in case someone may prefer to fiddle with the raw data. Right-click here to download the spreadsheet. This is not a program for learning how to cook. It is a feverish competition among world-class chefs "with the over-the-top appeal of pro wrestling". This week's secret ingredient: Carrot. As a professional writer, I can't help but feel skittish about the world class amateur writing appearing so prolifically in Blogs these days. Take this review of Gibson's The Passion of the Christ for example. None of the reviews I read in the old media come close to the depth and erudition of this one. Don't stop there. Read the more about all sorts of stuff on The Currency Lad. I've been startled about how few people seem to get The Passion. Traditional Catholicism placed enormous weight in the redemptive power of Christ's sacrifice. I remember an interview decades ago with the makers of Superman: The Movie. They made the point that, with The Six Million Dollar Man appearing on TV screens every week, Superman's exploits had to literally world turning. And so it is with the pain and suffering of Christ. For Gibson's emphasis on Christ's suffering to carry any weight, it had to obviously exceed the suffering of characters routinely appearing in modern movies. The heyday of religious movies pre-dated graphic Peckinpahishness, and so could be more restrained while remaining shocking. Since it started up on SBS here in Australia a few weeks ago, I've been keenly watching MythBusters. Scientists the guys aren't, but I do like the way they just whip up a test rig from whatever they have laying around. In case you haven't seen it, each week the two chaps take about three urban legends and put them to the test. Will a mobile phone ignite a petrol station? No. Will eating several poppy-seed buns make you show positive on a narcotics screening test? Yes. Last week the final segment was testing the Killer CDs myth. Will CDs blow up from centrifugal forces if spun too fast? Well, of course. Anything will blow up if spun too fast. The picture to the right shows two sequential frames from a high speed camera they used to record the demise of a damaged CD (it had been microwaved!). Unfortunately, they left the impression that a 52x CD ROM drive actually works at 52x. 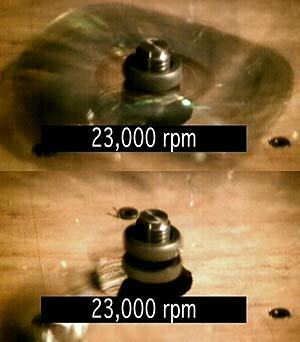 In fact, it works up to 52x, and generally much slower, because it is designed not to go much above 10,000 RPM. You can read my analysis of this issue here. This episode of Mythbusters will be repeated on Monday (7 Feb) at 5pm.